What is Structured Cabling and why it is important nowadays. Structured Cabling is a type of infrastructure that supports the performance of an organization’s cabling system or network. It is the glue that units all PCs, phones/mobiles and other devices used within the business together. 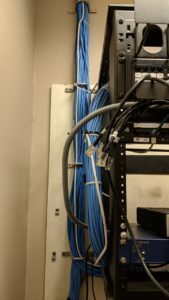 It provides a better option for organization and can prevent costly mistakes that often occur due to unorganized cabling systems or multiple, unlabeled wires haphazardly lining office floors. It also reduces the cost of cabling expansion and decreases the mess and clutter typical of older networking solutions. Structured cabling is a future proof investment. It allows a much easier and more affordable expansion in the future. You can make changes, add-ons or removal in your data center quickly and easily. Structured Cabling is cost efficient. It reduces power and maintenance costs as it can easily figure the faulty system and rectifying any issues on it. Structured Cabling provides flexibility. If you’re in need of expanding or need to make adjustments in the future, your cabling provider will be implicitly understand the basic system configurations and easily decide where to begin. Structured Cabling reduces downtime. With a complete and organized cabling system, it will cut the risk of human errors as the system is programmed based on your network needs. Stop worrying about your company’s network system. Hire the best Structured Cabling Provider and be ahead of anyone. With Jackson Computer Consulting, your company is in good hands. For free quotation and consultation, Call us at (412) 853-3708 or simply send us an Email at info@JCCHelp.com.